As part of the Clean Water Program, the Department of Public Works is upgrading the existing aging and undersized sewer network. This work will increase the integrity of the sewer system, reduce sewer overflows during storms, and help the City meet regulatory requirements. These project areas were selected using hydraulic modeling to help determine the most efficient, cost effective solutions. Basin 1b, located in the central portion of San Mateo, consists of project work in two different areas. Most of the work is the alignment from Edinburgh Street to 16th Avenue, as shown on the map below. 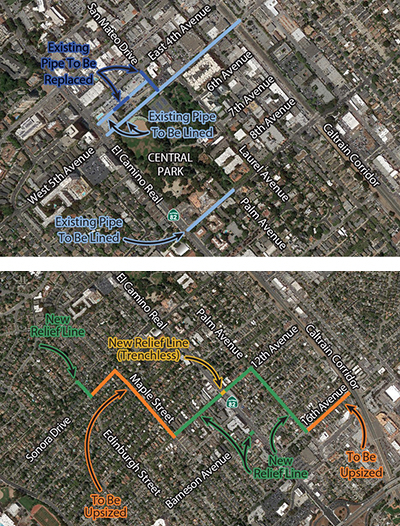 Orange marks where existing sewers will be replaced (2,935 feet), while green and yellow show new relief sewer lines (3,260 feet). A short, 10-foot span of new pipe under Barneson Avenue is also planned. The rest of the project comprises rehabilitation and replacement work in downtown San Mateo on San Mateo Avenue, the alley between East 4th and East 5th Avenues (between San Mateo Drive and El Camino Real), and 9th Avenue between El Camino Real and Palm Avenue. The total length of repaired, rehabilitated, and upsized pipe is 9,340 feet. Work is within the City’s, California Department of Transportation’s, and Caltrain’s rights-of-way. Some lane closures and traffic control will be required for pipeline work within City streets. The project will also be coordinated with the Fire Department, Police Department, Recology (a local integrated resource recovery company), and local utilities, such as PG&E and Comcast.